It's 4:20 somewhere in the galaxy right now. Kick back, spark up, and soak in the delicious guitars and trippy, minimalist visuals in this video from French metal band Gojira. The song is "Born in Winter," and the album is L'Enfant Sauvage — available from Roadrunner Records. 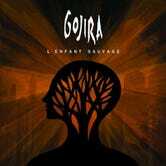 Learn more on Gojira's website.